ARCATA BALL PARK – The roster for a fun night of drag softball has been released. 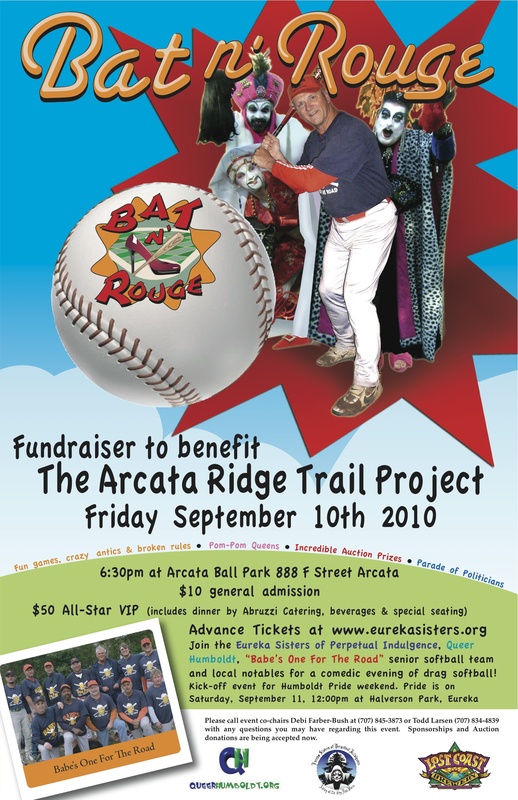 Bat N’ Rouge – softball with a twist, will happen at the Arcata Ball Park (Crabs Field) on Friday, Sept. 10 beginning at 6:30 p.m. 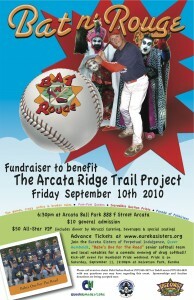 This charity softball game will benefit the Arcata Ridge Trail Project and is a collaborative effort between the Eureka Sisters of Perpetual Indulgence, Queer Humboldt, Babe’s One For The Road senior softball team and many community members. Goals for this event include but are not limited to raising awareness and money for the Arcata Ridge Trail Project, creating collaborations within our community, and to be the kick-off event for Humboldt County Pride Weekend. The Arcata Forest Fund Committee has been working on raising funds for the purchase of key parcels between the Arcata and Sunny Brae Community Forests. When complete, the four mile long Arcata Ridge Trail will connect the Arcata and Sunny Brae Community Forests together and beyond to West End Road. Donations are held in the Arcata Forest Fund at Humboldt Area Foundation. The Arcata Forest Fund provides a source for private donations to assist the City of Arcata in purchasing land adjacent to the Arcata Community Forest and the Sunny Brae Forest. Private contributions help the City by providing leverage for Federal, State and non-profit foundation grant funds. The acquisition of the Arcata Ridge Trail parcels will provide permanent protection of open space, timber resources and watershed values, wild life habitat, corridors and access for recreation. Bat N’ Rouge is a wacky softball game with all the bells and whistles of a conventional softball game including Pom Pom Queens (the PPQs). The rules have been waived, cheating is a great thing, and homeruns can be purchased. The entire game is professionally choreographed by the Eureka Sisters of Perpetual Indulgence with music and traditional ball game sound effects. Community members, “Notables”, and “Politicos” are very excited to change from their traditional clothing into “drag garb” and batter-up, all while raising money for a great cause. In addition to softball, there will be major audience participation. Food and beverages (sponsored by Lost Coast Brewery) will be available for purchase and a special All-Star VIP section will be offered in the picnic area where attendees with All-Star VIP tickets will be catered in a more exclusive manner with dinner by Abruzzi Catering. A live auction during “HALF TIME” will occur with approximately 10 large items auctioned off along with a special “Parade of Politicians” (politicos in the November Humboldt County Run-Off). event. Sponsorships and Auction donations are being accepted now. For more information and advance tickets, visit www.eurekasisters.org. Eureka Sisters of Perpetual Indulgence is a non-profit 501(c)(3) public service organization operated for charitable purposes and enlightenment of our community. This entry was posted on Tuesday, August 31st, 2010 at 10:09 am	and is filed under News, Community, Scene. You can follow any responses to this entry through the RSS 2.0 feed.